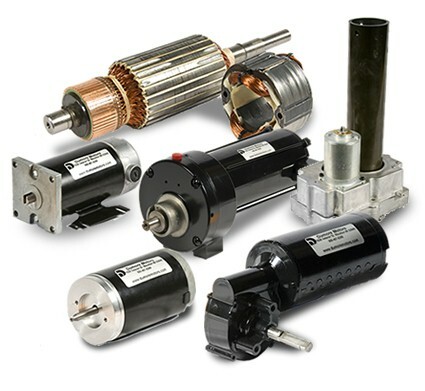 Dumore Motors is manufacturer of custom fractional horsepower OEM electric motors, gear motors and custom electromechanical motor assemblies for a wide range of OEM applications, including unique and demanding environments. Dumore Motors custom fractional horsepower electric motors and gear motors include permanent magnet DC motors, series wound universal motors, right angle worm drive permanent magnet DC gear motors, parallel shaft permanent magnet DC gear motors and planetary permanent magnet DC gear motors. All of these electric motors and gear motors are designed for cost effective customization to meet the exact OEM motor application. And if an application calls for a truly custom "clean sheet" electric motor and gear motor design, Dumore Motors engineering team is experienced and ready to work with you from concept through production. In addition to powering their equipment and systems with Dumore Motors electric motors and gear motors, OEMs worldwide partner with Dumore Motors for design and manufacture of custom value-added electromechanical motor and gear motor assemblies, sub-assemblies and complete turnkey products, providing them cost savings, time savings and additional competitive advantage. All of our custom electric motors, gear motors and electromechanical motor assemblies are engineered and manufactured in the USA at our 120,000 square foot state-of-the-art manufacturing facility located in Mauston, Wisconsin. Dumore Motors designs and manufactures custom fractional horsepower electric motors, gear motors and custom electromechanical motor assemblies for a wide range of OEM applications, including medical mobility and medical / health care equipment, fluid power, agricultural, industrial, material handling, construction, metal working, welding, HVAC, commercial cleaning, fire protection, door automation, power tools, food processing, and recreation equipment, off road vehicles, cranes, hoists, winches and many more. Dumore Motors custom DC motors and gear motors and custom OEM motor assemblies are recognized worldwide for unparalleled precision and quality craftsmanship. With Dumore Motors, you get the custom electric motors, gear motors and electromechanical motor assemblies you need, in the time frame and at the price you expect! Dumore Motors has been manufacturing custom electric motors, gear motors and assemblies since 1913. After almost 100 years, no matter the application, Dumore Motors core principals and focus remain the same. When applications demands the best, OEMs turn to Dumore Motors! Contact Dumore Motors and talk to one of our engineers about your application and needs. Let us help you select and customize the right electric motor or gear motor for your application, or work with you on a complete electromechanical motor assembly or turnkey product. At Dumore Motors, we take pride in making it easy to get the right electric motor, gear motor or complete electric motor assembly!